OSMcast!!! TEAPOTS 4-1-2014 – OSMcast! TEAPOTS. Just waiting for the TEA. To be put. In the pot. Teapot. We may be launching this episode on April Fool’s Day but this is podcast is no joke! By and large, anyway. This is more an excuse to show off Doug’s extensive (and still growing teapot!) collection. If you have ever wanted to know about teapots, what to look for in teapots, or just general teapot knowledge, this the podcast for you. SURE we talked about some teapots but if you want to SEE the teapots well guess what we got some pictures of Doug’s teapots right here! And did you need some Time Cues? We can do that. Basil even went out and found as many relevant links to buying your own as he could. SUCH A GENTLEMAN, THAT BASIL. 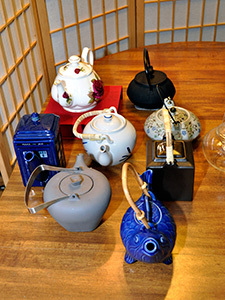 This entry was posted in OSMcast, podcast, Tea, Teapots and tagged podcast, tea, tea time, teapots by Basil. Bookmark the permalink.